KATHMANDU, July 17: The balance of payment (BoP) position of the country has slightly improved in the eleventh month of the current Fiscal Year 2017/18, but still remains on the negative side. According to the Nepal Rastra Bank (NRB), the overall BoP turned into a deficit of Rs 4.34 billion in the eleventh month of the current Fiscal Year 2017/18 that ends on Tuesday. 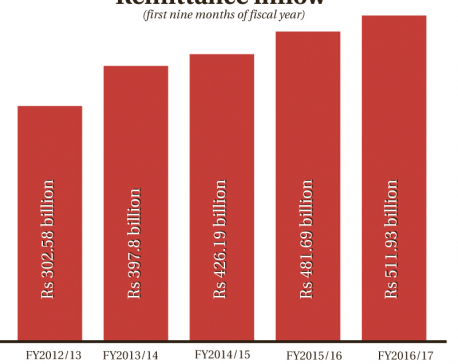 The deficit was Rs 18.9 billion in the tenth month. 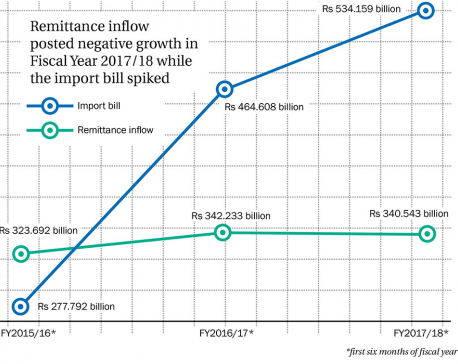 The BoP has been slipping into deficit since the beginning of the current fiscal year on the account of rising import bill, slow growth of export and deceleration in the remittance growth rate. The BoP summarizes transactions between a country and the rest of the world. It classifies transactions under two headings -- capital account and current account. Current account refers to the difference between the import and export of goods and services. However, as the remittance growth rate increased in the eleventh month and the foreign direct investment also grew slightly, the BoP deficit also narrowed down in the review period, according to the NRB. Similarly, the flow of foreign direct investment (FDI) rose to Rs 15.88 billion in the eleven months compared to Rs 12.27 billion in the corresponding period of the previous year. According to the ‘Current Macroeconomic and Financial Situation of Nepal (Based on Eleven Months’ Data of 2017/18), the workers’ remittances increased 7.3 percent to Rs 679.73 billion in the review period compared to a rise of 5.8 percent in the same period of the previous year. However, the trade deficit continued to balloon in the eleventh month, when the figure widened 24.6 percent to Rs 1,033.04 billion. The merchandise exports increased only by 10.4 percent to Rs 74.31 billion while the growth in merchandise imports remained elevated at 23.5 percent to Rs 1,107.4 billion. The current account deficit also widened further to Rs 209.21 billion in the review period from a deficit of Rs 2.99 billion in the same period of the previous year. The BoP and current account deficit positions slipping into deficit reflect vulnerable external sector of the country, according to experts. Meanwhile, the year-on-year consumer price inflation increased to 4.1 percent in mid-June 2018 from 2.8 percent a year ago. The increase in food inflation contributed to a rise in overall inflation in the review period, according to the NRB. A surge in prices of vegetables, fruits, ghee and oil, milk products and eggs, among others were mainly responsible for the rise in food inflation in the review period. Non-food inflation, however, moderated to 5 percent in mid-June from 5.8 percent a year ago. “A slower growth in prices of education, clothes and footwear, furnishing and household equipment and housing and utilities, among others accounted for a moderation in non-food inflation in the review month,” read the periodic report of the NRB.